I just realised that it is harder to stick to a diet once I started working than when I was staying home. When I was working out, I started to eat healthy which meant we didn’t buy any junk food at all. Because sometimes it is so hard to control the cravings so it was best to make no junk food available at home. On top of that we introduced healthier food into our diet. So along with exercise, it was easier for me to stay in shape. It has been a month now that I am back at work and it seems like I am eating unhealthy food (cake, chocolates, and chips) more frequently. We have someone’s birth every now and then so the cake is always around. Also with the cake there will be chips and dips and sausage rolls which are hard to resist. I know I need to be in control more but it is so easy to let go when you see everyone else eating. It seems rude not to go to morning teas you are invited to as it is a good way to socialise but sometime saying no to cakes makes me stand out from the norm. 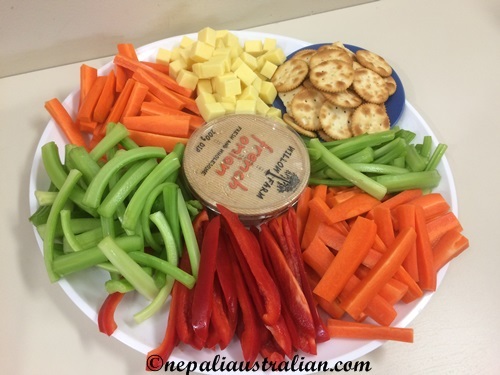 Last week I went to one morning tea and didn’t eat anything as there was nothing healthy, no fruits at all but I was so happy when I went to one today and saw this healthy platter. It had celery, carrot and capsicum with some cheese and biscuits. Perfect for someone who is trying to watch what they eat. I am definitely going to make sure we have this platter along with fruit platters on every morning tea we organise so I can eat without feeling guilty. How are you eating healthy when there is so much unhealthy food around? So much temptation everywhere you go. What do you say to decline politely if someone offers you a piece of cake? 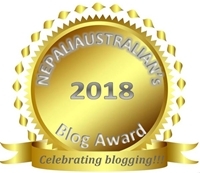 This entry was posted in Being Mum, Health and tagged Australia, australian, australian nepali, baby, baby body, body, cakes, capsicum, carrot, celery, fruits, healthy food, healthy mind, M from nepaliaustralian, mum, Nepal, Nepalese, Nepali, new mum, post baby body, pre baby body. Bookmark the permalink. In answer to your question, saathi, I will accept the piece of cake and enjoy it. But at home here in Lisbon it is completely different. I deliberately don’t buy those unhealthjy snacks so I won’t get tempted at home. I am a healthy eater and eat lots of vegetables. My exceptions are french fries, mayonnaise and fruit yogurts so I try to use those wisely. I don’t like most meat in any case so in my home we can only find fish and chicken breast with no fat. My meals are varied but my commonest ones are, dalbhat with saag, fish fried in EV olive oil with a large salad. Each day I try to eat several types of vegetable and my commonest are: capsicum, olives, tomatoes, butternut squash, raw spinach, beetroot, celery, carrots. My downfall is that I love a glass of wine or beer in the evenings and that gives me unwelcome calories. I’m a light drinker compared to Nepalese guys but I’m a regular drinker. Don’t think that means I’m a drunkard though because I hate drunkards and that sort of nonsense. I usually stop after one glass but sometimes will have a second. I learned that over time, eating healthy is a lifestyle. If you choose to eat healthy, you feel guilty when you eat unhealthy food. Of course you are allowed occasionally cake and chips. You seem to have a very good eating plan so some wine and beer should be ok for your health.